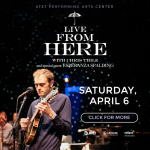 Live from Here with Chris Thile heads to the Winspear Opera House on Saturday, April 6, featuring The Head and The Heart and Esperanza Spalding! Enter by midnight on Tuesday to win tickets. Here’s what’s on tap this week on ‘World Cafe.’ Listen M-F at 10pm on KXT.